Grease a 9 x 13 inch pan and then place parchment paper inside spanning the width and allowing it to hang over the sides. This acts as a sling to help lift the bars from the pan. Using a medium sized bowl combine the dry ingredients: flour, ginger, salt, baking soda and baking powder. Set bowl aside. In a large mixing bowl, beat together the butter and brown sugar until smooth. Add eggs, vanilla, and orange zest mixing well. Gradually add the flour mixture and blend until combined. Do not over mix! Stir in cranberries, white chocolate chips and candied ginger. Bake 30 minutes until edges are light brown and a toothpick inserted in the center comes out clean. Let bars cool prior to frosting. Add the powdered sugar, vanilla and orange juice. Beat about 1 minute until fully incorporated. 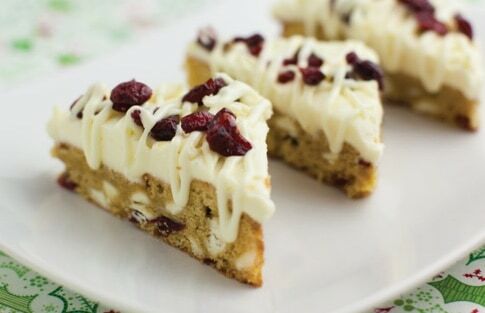 Spread the cream cheese frosting onto the bars and sprinkle with dried cranberries. Remove from pan and cut into squares or triangles.